The Great Ocean Road is truly, really, absolutely, one of the world's most beautiful drives. Like the drive up California's coast on Highway 1, the Great Ocean Road is a lovely meander that should be on your bucket list. You'll see sights like the cliffs at Port Campbell National Park, a historic lighthouse, and the Twelve Apostles, plus places where you can spot Australian animals like kangaroos, koalas, parrots, and penguins in the cold, clear, clear surf, across which you can imagine seeing to Antarctica. You can rent a car, of course, or you can take a day (or a few days) tour with a tour bus down the Great Ocean Road. Bells Beach: Your driver will likely tell you that the Keanu Reeves/Patrick Swayze surfer crime flick, Point Break, wasn't really filmed here, though the movie depicts Swayze facing the ultimate monster wave (supposedly) on this beauty beach. What is true about Bells Beach is that surfers have swarmed this spot for decades, and Great White Sharks have been knowing to drop by for lunch. Many tour bus companies travel the Great Ocean Road, and most offer the same basics: a friendly driver, pick-up and drop-off by the tour mini-bus at your hotel, hostel, or one of the several central spots, and (probably) a morning tea break and any entrance fees, like to Otway National Park. Your bus tour will likely give you the option to take a helicopter ride over the Twelve Apostles, though it will cost extra. Read more about that below. Expect to buy your own dinner on the way back to Melbourne if on a day tour. Spotting Australian animals along the Great Ocean Road is as easy as pulling over, which your tour bus driver may do at Kennet River Township, where you're almost guaranteed to see koalas, crimson rosellas, and perhaps anteaters. The crimson rosella, a parrot native to East and Southeast Australia, is said to be easiest to see in the early mornings and later in the afternoon. Your driver may hand out bird seed for you to feed to the resident crimson rosellas, who may jump onto your hand for lunch. Koalas abound in the eucalyptus forest here, and koalas are very slow-moving animals. You're bound to see 'em. Koalas sit still for so long, in fact, that Mother Nature's given them no nerve endings in their behinds. They've got claws, though, and koalas are wild animals, so make sure to treat them with respect. Built in 1891, the Split Point Lighthouse at Otway National Park, west of Melbourne, was originally called the Eagles Nest Point lighthouse and is also known as the White Queen. Stop in and wander down to the tip of the tiny spit to look out on what's called Australia's Shipwreck Coast. Over 700 ships are thought to litter the ocean floor off the coast of Victoria, Australia's southeastern mainland state. You can arrange accommodations at the Cape Otway Lighthouse not too far from Split Point, staying in the historic lighthouse keeper's quarters. Call (03) 5237 9240 or check the lighthouse's website. Great Otway National Park covers a beautiful piece of Australia from the slopes of a rainforest down to the rugged coastline where you'll find the Otway Lighthouse. If you're on a Great Ocean Road bus tour, you may take a tea break at Otway National Park's rest area, where the views are completely killer, almost like a painting, and keep going up the road to drive inland and take a stroll along the paths of the Maits Rest Rainforest walk. Australia's present-day state of Victoria's southwest coast was inhabited for thousands of years by clans of the Wathaurong and Katabanut tribes; Anglos landed at what became Port Phillip (and a penal colony) with English Lieutenant John Murray in 1802. Van Diemen's Land (Tasmania) settlers sailed to Port Phillip in 1835, and a flood of Anglo entrepreneurs followed, populating Melbourne and, sparsely, the coast; eventually, the coastal residents began calling for easy transportation. A railroad idea was rejected and after much debate, construction began on the Great Ocean Road in 1919; almost 3000 Australian soldiers recently returned from World War I worked on the road, declared to be a monument to their fallen comrades. The Great Ocean Road was officially opened in 1932. About 10 or 20 million years ago, the limestone rock that would form a great plain bridging the present-day Australian states of Victoria and Tasmania began forming from marine skeletons, like shellfish and calcium rich algae. About five million years ago, the sea level dropped and the plain was exposed; as the sea began rising again 18,000 years ago, the spectacular cliff formations you can see now on the southern coast of Australia west of Melbourne began to be formed by the battering of waves and the seepage of rain through the limestone. 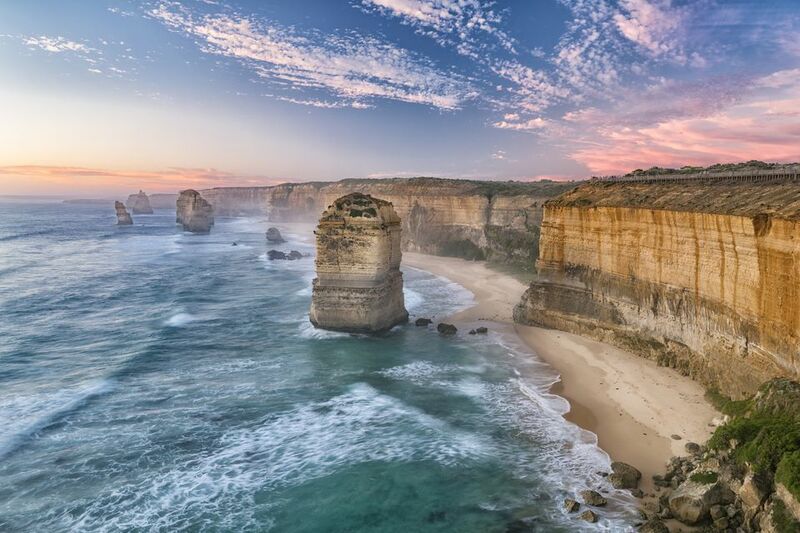 A drive down Australia's Great Ocean Road will bring you to Port Campbell National Park and the iconic limestone rock formations on its coastline. Some famous formations include the Twelve Apostles and London Bridge (five miles from Port Campbell). Whether you're driving your own car or taking a bus tour down the Great Ocean Road, you'll be able to stop near Port Campbell National Park and hop a helicopter for a few minutes or an hour to fly over the Twelve Apostles, the famous and much-photographed limestone rock formations on this lovely drive. There were only nine apostles, which is what these limestone stacks in the sea are called, in recent memory when they were renamed, perhaps for touristic value, the Twelve Apostles, after having been called the Sow and Piglets for years. A 2005 collapse of one apostle left eight standing...and they are outstanding. Figure about $10 a minute for a scenic helicopter flight over the Twelve Apostles. Try 12 Apostles Helicopters at the Twelve Apostles visitor center parking lot.